- One small zip pocket inside the basket to keep money, change etc. - With Zipped Cover (Lid) to close the basket if needed. - Best Shopping basket for your day to day purchases. - Collapsible, easy to clean, stylish, portable, large capacity. - The fabric is double reinforced, waterproof, anti-rot, anti-mildew. Raja Basket Is Made OF 304/8/18 Grade Stainless Steel material and Nickle Chromium Process in every basket. (With Guaranteed Stamp At Each & Every Basket) Raja Basket is Available In Many Size . (12x20, 15x20, 17x20, 19x20, 21x20, 12x22, 15x22, 17x22, 19x22, 21x22, )And Also Available Party Tailour Made Size.Raja Basket Use 6MM & 3MM Wire In Each And Every Basket. 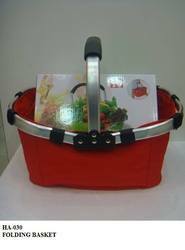 1) This basket is stylish and fashionable with colorful print. 2) It is also durable, foldable, portable and convenient. 3) The handle and the frame are made of ultra-light aluminum alloy which is stainless, strong and durable. Survi Home Appliances Pvt. 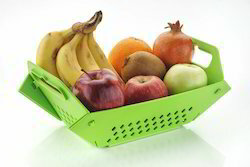 Ltd.
With the aim to provide our valuable clients with impeccable variety of product we present top grade Vegetable Folding Basket in the market.